Most commonly temporomandibular joint disorders are treated with an occlusal splint. 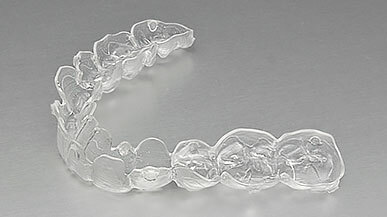 Other names for an occlusal splint include a nocturnal splint or a night guard. The most common type of occlusal splint used at Geelong Smile Studio is a Flat plane occlusal splint. This splint covers all your teeth and can be fabricated for the upper or lower jaw. The purpose of this splint is to help reduce the physical effects of tooth grinding on your teeth whilst sleeping. i.e rather than you grinding your own teeth away, you grind away the plastic of the splint rather than your own teeth. The separation of your teeth by virtue of wearing the splint can also help relax your jaw muscles. Often this nocturnal splint treatment is all that is needed to relax muscles and protect teeth from excessive effects of clenching and grinding. How is a splint made? After your initial consultation, impressions of your teeth are made. A laboratory technician will then make the occlusal splint. The splint will be fitted and adjustments made if necessary. Depending on your severity of symptoms, this will determine how often you will be expected to wear the splint. In the most acute and severe cases, initially you may be advised to wear the splint all day. Most people only need to wear the splint whilst sleeping.